Kiley developed at least two specifically aerial gardens, intended to be experienced from the air, as much as on the ground. These aerial gardens each deployed large pools connected by pathways and structured allées of trees. These two aerial gardens were also connected by the fact that the collaborators on the first, the Air Force Academy Campus, provided the recommendation for the second, an obscure public park and waterworks infrastructure on Chicago’s lakefront. The focal feature of Kiley’s design was a central parade ground containing a 700-foot-long gridded series of grass panels and fountains set along a north-south axis, which he called the “Air Garden.”Kiley intentionally offset his grid so that visitors to the garden would be unable to traverse the space in a straight line, counter to the structured rigidity of the cadet’s daily life. At one end of the Air Garden is a flagpole and at the other a memorial and u-shaped pool containing five water jets. Drawing the eye down the length of the landscape is a series of rectangular clipped hedges of American holly, and on either side of the watercourse, a grove of honey locusts is densely planted fourteen feet on center, four trees wide. Throughout his design Kiley took into account the needs of the campus and the Cadets daily routine. According to Jory Johnson in the essay Man as Nature: “As Kiley explains, the Air Garden is not intended to have the same sense of dominion as Versailles or other grand French gardens: ‘We have to look at where we are today. I use geometry and Le Nôtre used geometry, but we have different understandings of the universe.’ Instead of extending the prominence of a particular building or institution – the gardens of Versailles radiate from the Chateau – the Air Garden extends the life of the cadets.”  Both metaphysically and physically this is the case with Kiley’s design, illustrated in the eighty-one-foot-wide promenade of white marble that surrounds the Air-Garden on four sides. The breadth of the promenade is specifically calculated in order to accommodate the strict formations of marching cadets. This rhythm is mirrored in the pathways formulated to accommodate a single cadet (four feet wide), or two (six feet wide). Kiley’s landscape was already in decline by the late 1950s, before the plan’s implementation was even complete. When the last building was constructed, the Air Force handed over responsibility for management and maintenance to the Army Corp of Engineers. As a result, elements of Kiley’s design were not built, including the curvilinear landscape concept around the dormitories. Over time the built landscape further declined; dead trees were not replaced, the naturalistic ravine Kiley incorporated was removed, and perceived maintenance issues led to the Air Garden’s gridded fountains being filled with sod, dramatically altering the look, feel and intent of the design. Honey locusts have proven to be poor choices in some campus areas exposed to harsh temperatures and wind. In the 1980s Air Force Academy graduates began returning to the campus in leadership roles, and pride in the school’s heritage has led to a desire for building and landscape restoration. In the 1990s the Academy commissioned restoration plans along with strategies for dealing with development encroachment from nearby communities. As a first step the fountains at the north and south ends of the Air Garden were restored to their original design. Since then, work has been slow, with funding for the project made more difficult by 2013’s sequestration. But the Air Force Academy’s leadership is committed to the plan and intends to continue with restoration efforts as funding allows. 1 Kiley, Dan and Jane Amidon, Dan Kiley: The Complete Works of America’s Master Landscape Architect (Boston, New York, London: Little, Brown and Company, 1999), 28. 2 Skidmore, Owings & Merrill, United States Air Force Academy Base Comprehensive Plan: Cadet Area Master Plan (1985), 62. 3 Kiley, Dan and Jane Amidon, Dan Kiley: The Complete Works of America’s Master Landscape Architect (Boston, New York, London: Little, Brown and Company, 1999), 29. 4 Johnson, Jory. 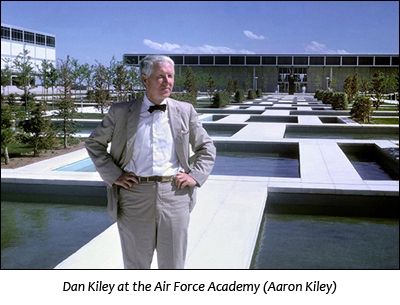 “Man as Nature” In Modernism at Mid-Century: The Architecture of the United States Air Force Academy, ed. Robert Bruegmann (University of Chicago Press, 1995), 116. From The Cultural Landscape Foundation web site. Original article HERE.